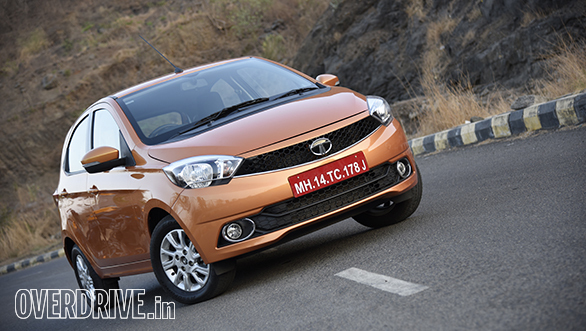 Tata Motors' new small offering Tiago has surpassed 15,000 bookings in India and has received more than 1,00,000 inquiries within the first month of its launch. Tata Motors is placing high hopes on this car, which competes with the Hyundai i10, Maruti Suzuki Celerio and the Chevrolet Beat. Based on the modified XO platform which is also the underpinnings of its bigger sister Bolt, Tiago starts at a highly competitive price of Rs 3.2 lakh. The Tata Tiago comes with a three-cylinder 1.2-litre petrol Revotron engine which makes 85PS and 114Nm, whereas the 1.05-litre Revotorq diesel churns out 70PS and 140Nm. Tata is only offering a manual transmission for the time being, but an AMT is in the pipeline for the future (as an option). The Tiago returns an ARAI-certified fuel efficiency of 23.84 kmpl on petrol and 27.28 kmpl on diesel. SN Barman, VP, sales and network, Tata Motors, commented that the price of the Tiago might be increased soon as it is difficult to hold on the aggressive introductory price. Considering the popularity that the car is enjoying and having already sold more than 3,000 units, its waiting period is expected to increase from its present value of two months.